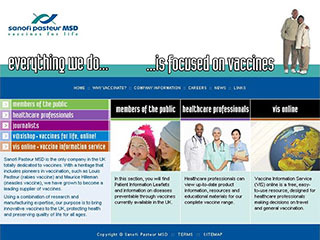 Sanofi Pasteur MSD is the only company in the UK totally dedicated to vaccines. With a heritage that includes pioneers in vaccination, such as Louis Pasteur (rabies vaccine) and Maurice Hilleman (measles vaccine), we have grown to become a leading supplier of vaccines. The re-launched Sanofi Pasteur MSD UK corporate website has a fresh new look and feel. The new design features the company's primary colours, and has colour coordinated sections (members of the public, healthcare professionals, journalists, V@xishop, and VIS online) throughout the site. Functionality has altered with access to the healthcare professionals section no longer restricted to registered users. Improvements have also been made to the management of registered users for VIS Online.